Anyone taking an interest in panorama photography will probably read that “The nodal point of the lens must be directly on the axis of rotation” when shooting frames for stitching. This is a common misunderstanding, repeated on many web sites and in many books on this subject. It is, in fact, the entrance pupil of the lens, not the nodal point, that should be on the axis of rotation. Nodal Point or Entrance Pupil? To be pedantic we should first mention that a lens has two nodal points, one front, one back, but neither of these is relevant to the production of stitched panoramas. The second point to note is that whilst many authors get this bit wrong their method for setting the correct position of the camera is usually right as it puts the entrance pupil on the axis of rotation. The entrance pupil is quite simply the hole in the centre of the iris, or more precisely, the image of this viewed through the front element of the lens. 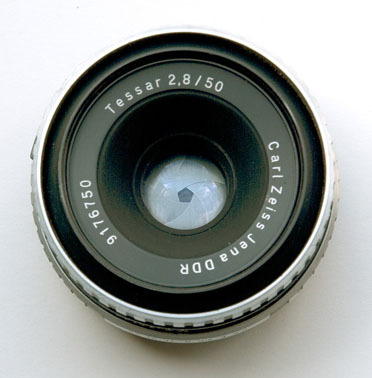 This old lens shows it clearly – it is less easy to see in a modern lens. So a simple way to set the correct position of the camera on the panoramic head is to view the camera from the front and set it so that the entrance pupil does not move laterally when the camera is panned. Once you understand why this works you will appreciate that nodal points are irrelevant. How important is it to keep the entrance pupil over the pivot? But just how important is this? Intuitively it must be less important if the scene contains no objects close to the camera, but at what distance does it become significant? In fact, by taking as our criterion for tolerable movement the well established ‘circle of confusion’ we can derive a ‘rule of thumb’ which is that ‘The ratio of acceptable (lateral) movement to the distance of the nearest object is one to one thousand’. As an example, an object at 10 metres would require that the lateral movement be less than 10 mm. This figure relates to a 35mm focal length lens on a 35mm camera. Longer focal length lenses will be less tolerant of movement. Special panoramic heads which allow for this adjustment are rather expensive. In the next Technical Note I explain how I made my own from bits in the junk box.